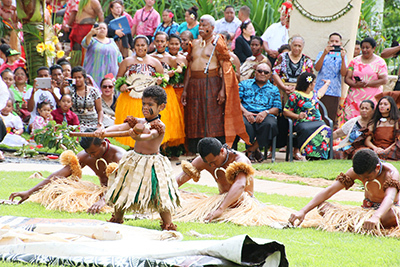 In keeping with island traditions, the Polynesian Cultural Center always planned to hold a “grand reopening” celebration for its recently renovated Tongan Village on June 11, 2016; but then the king and queen of Tonga — His Majesty King Tupou VI, King of Tonga, and his wife, Her Majesty Queen Nanasipau’u — accepted an invitation to attend the event, and customary Polynesian protocol rose to much higher levels. Upon arriving at the PCC gate near the Hamana Kalili statue the afternoon of June 10, the Hawaiian Villagers at the Center heralded the royal couple’s arrival with seashell trumpets, drums and chanting. PCC President & CEO Alfred Grace and his wife, Valerie, greeted the royal couple and presented the customary flower leis. 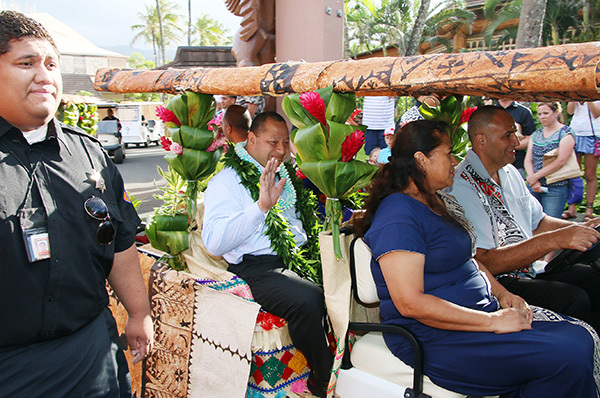 The Hawaiians performed an ancient-style hula kahiko; and then the royals and the Graces boarded a specially decorated electric cart and proceeded through two long lines of PCC employees, service missionary volunteers and lucky guests to the nearby Samoan Village activities. 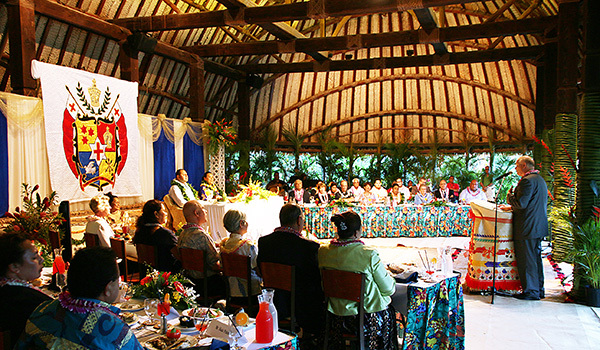 The welcoming banquet had been set up in the large Samoan fale (house), because the Tongan Village was still being prepped for the reopening program the next morning. In keeping with Tongan tradition, PCC Physical Facilities staff had erected a temporary, raised throne-like dais for the king and queen and hung a large Tongan coat of arms crest at the back. Meanwhile, all the other invited guests and members of the royal entourage had already taken their seats at the banquet. The king’s entourage included the Hon. Semisi Sika, Minister of Tourism and Infrastructure, who is also a BYU–Hawaii and PCC alumnus; the Hon. Tupouahomee Tuita, Cultural Director; Gary Pasina Lavaki, a cultural consultant and PCC alumnus; Mr. Motu’apuaka, his majesty’s talking chief; Mrs. Viela Tupou, Lord Chamberlain and private secretary; Siaosi Kaho, ADC; Siale Puloka, Assistant Secretary, Palace Office; and Ms. Palolo Uata and Ms. Ilaisaane Loloa, Personal Assistants. The Church of Jesus Christ of Latter-day Saints, which founded the PCC in 1963 to help preserve and portray finer aspects of Polynesian culture and provide jobs for students at the adjoining Brigham Young University Hawaii, sent Elder Dale G. Renlund of the Twelve to address them at a banquet that evening. His wife, Ruth, accompanied him. Other members of the Latter-day Saint delegation included Elder O. Vincent Haleck, General Authority Seventy and first counselor in the Auckland, New Zealand-based Pacific Area Presidency, and his wife, Peggy Ann; Elder ‘Aisake Tukuafu, Area Authority Tonga and his wife, Lose; Elder Aley K. Auna Jr., Area Authority Hawaii and his wife, Danelle; BYU–Hawaii president John S. Tanner and his wife, Susan; Eric Shumway, a retired BYUH and former PCC president who holds a Tongan chiefly title, and his wife, Carolyn; and Kalo Mataele Soukop, a former PCC labor missionary, original cast member, and emerita member of the PCC board of directors, and her husband, Harry. Before dinner, the king graciously shook hands with the invited guests; and as everyone ate, a group of Tongan men from the Tongan Village and community serenaded the royal couple with Afi Mei Pulotu (Fire From Heaven), a song specially composed as a gift to their majesties to celebrate their historic visit. 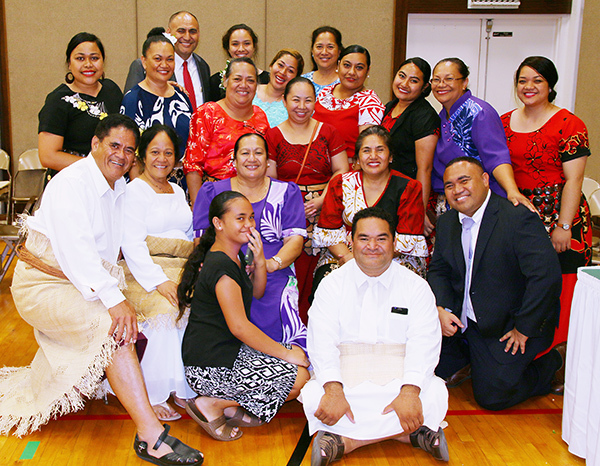 The ballad relates how members of the royal Tongan family have courageously assisted Latter-day Saint efforts in Tonga, starting with the first missionaries who arrived in 1891 and extending to the contemporary efforts of Prince ‘Ata, who the king and queen recently allowed to be baptized. Elder Dale G. Renlund of the Twelve (right) addresses H.M. King Tupou VI (left, on the dais) and H.M. Queen Nanasipau’u (on his right). Following dinner, Elder Renlund spoke of the importance of family and pointed out that his own “ties to Tonga” came through his mother-in-law, who had been born in Nuku’alofa, capital of the “Friendly Islands,” when her parents served a Latter-day Saint mission there, and that he had been required to learn to say the traditional Tongan greeting, Mālō e lelei, when he was courting his wife. He also spoke of the importance of families. BYUH President Tanner also told the royal couple that approximately 130 Tongans comprised the largest group of Polynesian students at the university. 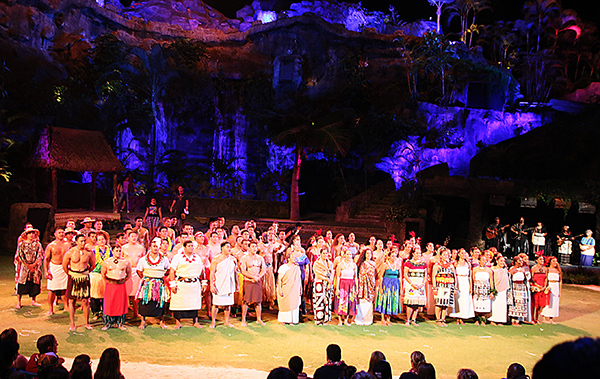 Moving on to PCC’s Pacific Theater, the king and queen were introduced to the Hā: Breath of Life evening show audience. As they did for the preceding banquet, PCC Physical Facilities staff had removed some of the seats from the lower-center-section to build a raised “throne,” where the royal couple enjoyed the production. The cast of the PCC evening show, Ha: Breath of Life serenades the royal couple. Under beautiful skies the next morning, June 11, President Grace and his wife, Valerie, escorted the king and queen to the Tongan Village on a canoe. Disembarking, the royal couple walked along a ngatu (tapa or bark cloth)-covered path, passed under an arch decorated in their honor, and took their places on yet another raised, throne-like dais in front of the queen’s summer palace in the village. 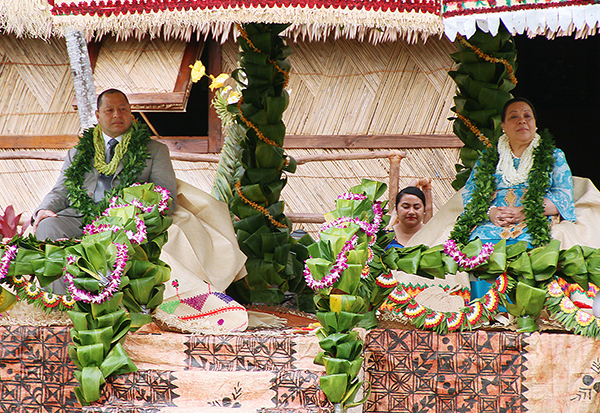 H.M. King Tupou VI (left) and H.M. Queen Nanasipau’u (right) “reign” over the grand reopening of the PCC’s recently renovated Tonga Village from a raised throne-like dais in front of the queen’s summer palace. Following songs by the Kahuku 3rd Ward Latter-day Saint Tongan choir, a prayer, and the choir again singing the Tongan national anthem, Tongans from the Center, BYU–Hawaii and the community presented the royal couple with traditional gifts, including a large kava root, three very large whole-cooked pigs, other food, lengthy pieces of bark cloth, hand-woven mats, and more. 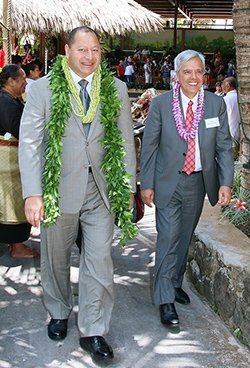 King Tupou VI (left) with Elder O. Vincent Haleck of the Seventy and First Counselor in the Auckland, New Zealand-based Area Presidency: Elder Haleck, who blessed the reopened Tongan Village, will become Pacific Area President in August. “I bless it that as many, many will come to this wonderful place that they will be touched in their hearts, that they will find tranquility, that they will indeed find a friendly people — friendly not only in their smiles, but more friendly in the richness of who they are in the cultures and the peoples that they represent,” he said. He explained he and the queen had previously visited the PCC as tourists, but this was their first official visit. He said his father, the late King Taufa’ahau Tupou IV, paid several official visits, and other members of the royal family had also come over the years. In fact, the late Queen Salote III, the current king’s grandmother, authorized the addition of a quarter-scale replica of her fale fakatu’i or summer palace when labor missionaries were first building the PCC in the early 1960s and sent two skilled craftsmen to oversee its construction. 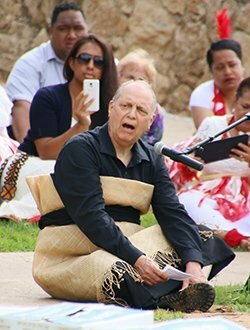 Next, in keeping with Tongan custom, the Center had asked retired BYU–Hawaii and former PCC president Eric Shumway to sit opposite the Tongan Village green and interact in high oratorical Tongan with his majesty’s talking chief, Motu’apuaka, who sat on the ground near the king’s feet. 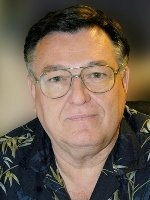 As a young Mormon missionary in Tonga, Shumway had developed such an unusual fluency in the Tongan language that he was asked and given permission to take the Tongan chiefly title Faivaola. Approximately 40 million visitors have come to this small community on the north shore of Oahu in the fifty-plus-years since then. The 4-year-old grandson of the PCC’s first Fijian Village “chief” Ratu Isireli Racule, leads the villagers’ offerings on behalf of the current “chief”, Ratu Inoke Seru Suguturaga, who is one-quarter Tongan on his mother’s side and related to the queen. At the end of the program, each of the PCC’s other villages — representing Hawaii, Tahiti, Aotearoa (Maori New Zealand), Samoa and Fiji — presented the king and queen with additional gifts, and sang and danced in their honor. President Grace, on behalf of the PCC executive team and board of directors, also presented the royal couple with a large, hand-sewn Hawaiian quilt, and a large supply of chocolate-covered Hawaiian macadamia nuts to take home. 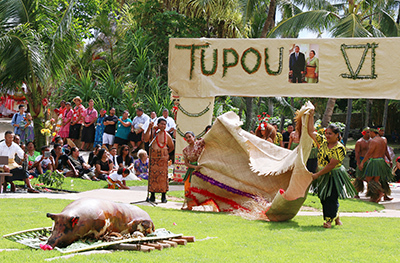 The Samoan villagers offer the king and queen another large, cooked pig, a fine mat and other traditional gifts. On Sunday afternoon, June 12, the action moved to the Latter-day Saint Tabernacle at the intersection of Beretania St. and Kalakaua Avenue in Honolulu, for an interdenominational pō hiva or evening musical “fireside” program. Choirs from the Kahuku 3rd Tongan Ward, the Kahuku Wesleyan Methodist Church and the Free Church of Tonga in Kalihi, a section of Honolulu, took turns filling the high-ceilinged acoustically-rich Tabernacle with magnificent music. (Left – right): Rev. Noa Vaea of the Free Church of Tonga in Kalihi, his wife Moana Vaea; retired BYUH and PCC president Eric Shumway – who acted as the PCC’s talking chief on Saturday; and the Tongan church’s secretary, Samuela Tatofi at the final grand reopening function. The Kahuku 3rd Ward choir, led by Tevita Toafa, filled the loft behind the speaker’s podium and took full advantage of the Tabernacle’s piano and organ. The Free Church group included a number of PCC employees, sat in the ewa-wing and used tu’ungafasi music sheets for some numbers — a notation system devised by a 19th century missionary to teach church music to Tongans; it uses numbers, strike-throughs, dots and other symbols instead of the standard European notes and staff, etc. The Kahuku Methodist group, sitting in the Diamond Head wing, brought several brass instruments to accompany their music. 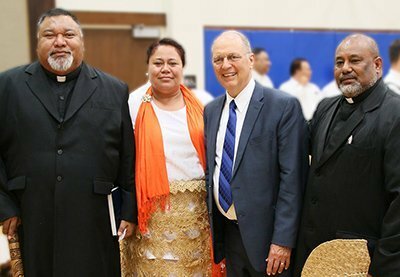 Shumway, who was also a former mission and temple president in Tonga, delivered the keynote speech — in Tongan, of course. His descriptions of learning the Tongan language many years ago, among other comments, obviously delighted those present. And typical of all Polynesian events, particularly Tongan ones, heavy refreshments — including Tongan otai fruit-and-coconut-cream juice — followed in the auxiliary hall. Many lingered, chatting with family and friends, seemingly reluctant to bring this historical event to a close. Some of the PCC team members and friends at the Sunday evening Program in the Honolulu Tabernacle. contribute to various PCC and other media. The 2019 World Fireknife website – your link to this year’s competition!!! !